On monthly basis, my transportation fees surpassed RM400 mark easily inclusive of sightseeing and touring on weekdays. According to Pei Lin, I will save about 25,000won with Seoul Subway Season Pass (정기승차권). Talk about saving!! 25,000won is worth a few lunches or even a piece of summer clothes! Not much but still it helps for a 백수 like me. 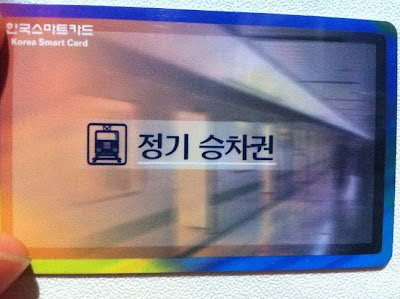 Card can only be used for Seoul Metro subways - 9 lines and up to 20km / 25km (Section 1). For 60 rides, per 30 days = 46,200 won. 46,200won / 60 rides = 770won per ride!! If you stay for a week or so in Seoul, then just buy the T-Money. If you stay more than a month, this card is worth the price.